Can Epson M1200 toner cartridges be recycled? If so, who / where do I send them to? Thanks, John. What does it mean that consumables are near end of service? What do I have to order? Where and how do I order? This message means thatyou need to replace the toner cartridge in your Epson AcuLaser M1200 printer. You can choose from any of the Epson M1200 toner cartridges shown on this page depending on which cartridge best suits your printing requirements. For example, you can buy our cheapest compatible Epson AcuLaser M1200 toner at the lowest price or you could buy a genuine Epson M1200 toner if you prefer to use cartridges made by the manufacturer of your printer. Simply click on "Add to basket" beside the toner you wish to order and you'll be redirected to another page where you can complete the steps needed to make an online payment. Alternatively, you can order a new Epson M1200 toner by phoning us on the number provided at the top of this page. Epson developed the AcuLaser M1200 printer to provide quality laser prints at an inkjet price. It is a snug black machine that is a great tool in a small office or business. The simplicity of the software and design make it decent for low to mid-range workload. With a great print quality on both text and basic graphics, it is worth taking a closer inspection for anyone needing a decent printer without the price tag. The size of the Epson M1200 pushes the boundaries of what an entry-level printer should be. While it is large, it has an attractive and unobtrusive appearance. The pop out trays for the input and output sheets are located on the top and front, as with most home office printers. There are two LED lights on the top right for paper jams, open covers, print data being received, and power. The Epson M1200 toner cartridges are easy to change and maintain with a simple slide out/pop in design. A hinged cover makes access to any paper jams easy and quick. 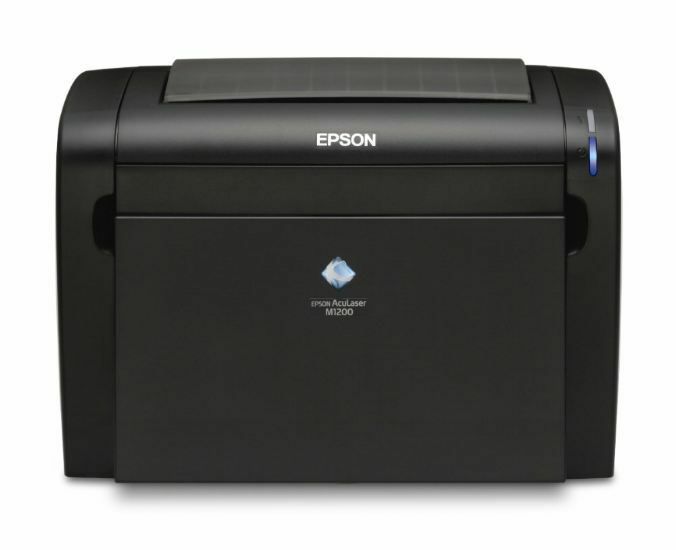 The Epson M1200 prints out pages quickly and cleanly. Epson rates this AcuLaser at over 20 pages per minute, but with full pages of text or graphics it will average closer to 16 pages per minute. All the lines, even with colour graphics, are smooth with no blur or discolouration. On computers running a Microsoft operating system, simply connecting the USB plug will install all the necessary software. A Mac OS X installation disc is also provided. For the price, it produces some of the highest quality prints in its range. After installing the operating software, Epson does seem to have problems with the printer being out of sync with the computer. Every time that the printer is plugged into the computer, it runs a secondary file. While this only results in only a few seconds of extra load time for larger jobs, it can become troublesome. It is an easy fix when uninstalling the software using the provided disc though. There is also a slightly higher cost per page, but with cheaper Epson M1200 toner cartridges available at low prices on Cartridge Save, the price difference may balance out.